Served warm, this decadent chocolate cake leaves an oozing puddle of chocolate behind on the plate. Sop it up with some of the solid pieces of cake, and you have the makings of the perfect dessert for special occasions like Valentine’s Day or for any day in between! This cake tastes especially delicious when garnished with a scoop of vanilla, cinnamon, or chocolate ice cream. Leave the butter on the counter for a while to bring it down to room temperature. This should take at least an hour depending on how warm the kitchen actually is. Preheat the oven to 350 degrees Fahrenheit. Grease six 6-inch soufflé cups generously with butter. 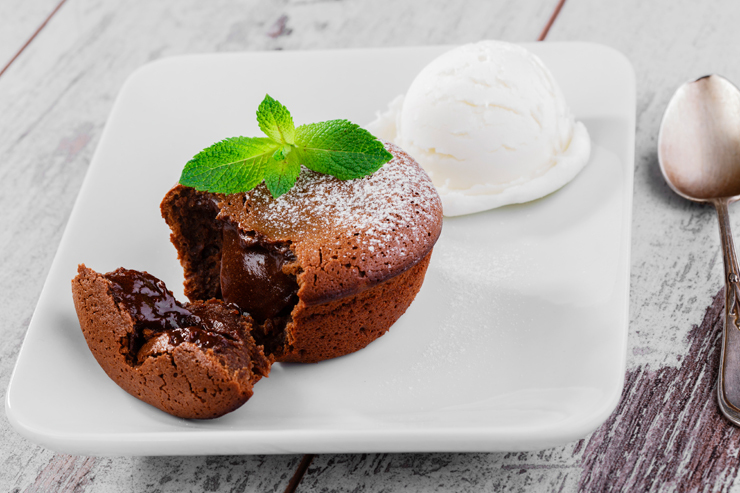 Sprinkle lightly with granulated sugar and tap the extra sugar out of the soufflé cup. Set aside. Chop the bittersweet or semisweet chocolate using a sharp knife. Melt with the 1½ cups of unsalted butter over a double boiler. When melted, stir using a rubber spatula until smooth. You can either buy a special double boiler system or improvise using this method. Once the butter and chocolate are melted, remove the top bowl of the double boiler from the heat and set aside. Add the egg yolks to a separate mixing bowl and whisk vigorously using a large balloon whisk until the yolks are broken up. Begin beating the yolks using an electric mixer set on low speed. Add the large eggs one at a time and beat until smooth. Slowly add the butter and chocolate mixture and beat until smooth. Turn off the mixer. Put the confectioners’ sugar and flour into a fine mesh sieve and sprinkle gently over the chocolate, butter, and egg mixture. Beat on low speed again until the confectioners’ sugar is incorporated into the batter. Carefully pour the batter evenly into the 6-soufflé cups, making sure to stop when the batter reaches ¼ of an inch from the top. Place the soufflé cups on a baking sheet and place in the center of the oven. Bake for about 18-20 minutes, or until the cake puffs up and is roughly 1 inch higher than the rim of the cup. The center of the cake should be soft so make sure that you don’t overcook it! Remove the baking sheet from the oven and invert the soufflé cups over onto a plate. You’ll want to serve these cakes immediately because the magic happens while it’s still warm. Right when your fork cuts into the cake, the soft chocolate should pool onto your plate. This won’t happen when the cake cools down. Top each cake with a scoop of ice cream and garnish with a mint leaf.